As a financial advisor I meet many professionals and families regularly to understand their needs and advise them suitably. Often the topic of discussion is in “how prices have gone up” and “how difficult it is to save now” and “how much interest rates have dropped resulting in low returns” etc.. etc.. I usually pose a simple question to them. How much do you spend monthly on the morning newspaper delivered to your house. The answer I get is Rs 120-150 p.m. I then ask how many years will you read the newspaper and the obvious response is “entire lifetime” say 80 yrs. I then tell them if you just saved the money spent on the newspaper (Rs 150 p.m) thru your life time and if we assume just 2% p.a inflation on newspaper prices (which you will anyway pay without questioning) and this money saved fetches an 8% p.a return, then how much it will become? Most people give a wild guess that is far off the mark!! Well, the answer is Rs 1.46 crore - in your lifetime!! Shocking, but true!! See the workings in image attached. I stopped reading newspapers more that 5 yrs back and still stay well informed. How about you? Recently I was reading an article by Meb Faber on Tactical Allocation approach to Equity investing using the Sector Rotation model. This approach takes a short to medium term view that complements a long term asset allocation strategy. We tried to apply this to the Indian equity markets. In this approach, the top "X" sectors (could be top 1, 2 3 etc) which have shown good performance over recent 1 / 3 / 6 / 12 month period are identified and ranked and the portfolio is split across the top "X" sectors. Let's say we choose the "Top 3" sectors. The money is equally allocated @33.33% across the Top 3 sectors. The portfolio is re-balanced every month. If at the end of a month, a currently allocated sector falls out of top 3, the money is taken out of that sector and invested into the new sector that has come into to Top 3. For simplicity of illustration, we have taken the last 1 year performance of each sector using the respective sector indices. 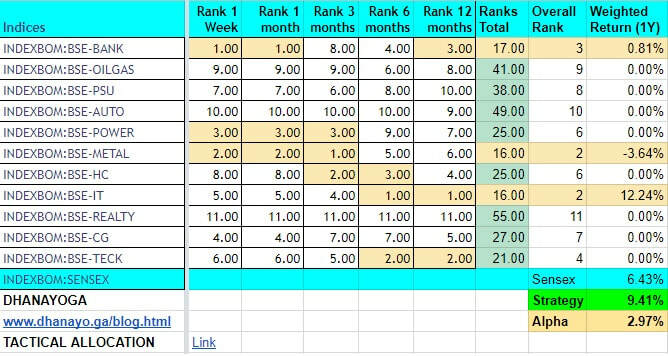 We have calculated the 1 week and 1/3/6/12 month rankings in terms of returns of each sector indices. We have taken an overall ranking (by summing 1 Week and 1/3/6/12 month rankings and further ranked the top 3 sectors. It is assumed the funds were invested in these 3 sectors in equal proportion, for the purpose of this illustration. We have created a simple worksheet to illustrate it. We have taken all BSE Sector indices and ranked them in terms of 1/3/6/12 month performance. We have also added a 1 Week performance as an additional parameter. he top 3 for each time period is shown in highlighted color. The overall rank of each time period is totalled and the overall ranking is shown in the last column to the right. For e.g., as date, the top 3 sectors (on a 1 Month ranking basis) to invest the funds are banking, power and metals. One can implement this approach by investing in the respective index or etfs tracking the relevant sectors. This is also useful if one wishes to shuffle the portfolio and reallocate funds to sectoral funds which are often cyclical in nature, so as to catch the wave and surf ahead. On the evening the demonetization announcement was made, (Nov 8), I was travelling back to Chennai from Mumbai. While on the journey, I was giving a thought on what would be the implications of this event and how we could apply it to Dhanayoga's Financial and Investment advisory business. Given that building client portfolios is one of our key services, we thought why not build a "DeMo" Portfolio and see how it performs. One option was to just build a mock portfolio and track it periodically. But this is no fun, if there is no real money going into the portfolio. Instead we at Dhanayoga built a real equity investment portfolio identifying companies that will benefit from Demonetization and invested real funds from our own cash kitty (call it "Conviction"). Dhanayoga "DeMo" portfolio has delivered 15.7% (absolute returns) in just three months flat, whereas both Sensex and Nifty returns stood at 3.6%. That is an Alpha of 12.1% for the THREE month period!! During the same period, how did the various Mutual Funds Perform? The 2017 budget has been unveiled. Dhanayoga has built a new "BudJET" Equity portfolio identifying stocks that will significantly benefit from the budget. Look out for our periodic update soon!! Do you wish to start the journey of creating "Value driven wealth"? People investing in Mutual funds can either invest one shot (say Bulk investment) or opt for Systematic Investment (SIP). Whichever option you choose to go with, an understanding on the "distribution mode" explained below can help you to earn significant higher return in the long term. RIP is often the ONLY mode typically offered by your Intermediary (Bank, Mutual fund Distributors, most Online Financial Portals and Financial startups etc), whereas DIP (Direct Investment Plan) option is something you need to specifically ask for (and demand). Most investors are neither informed or aware of the DIP Option (nor) do the intermediaries share this information with you willingly, unless you specifically ask for it (caveat emptor!). Direct Investment plans (DIP) were introduced in 2013. If you are a mutual fund investor who has been investing prior to 2013, certainly you will be enrolled in the RIP (Regular Investment Plan) only. If you are an investor who has started investing in MF post 2013 (but did not bother to ask for the Direct plan option (like most investors), because you did not know it existed (or) your intermediary hid it from you), you would most likely been enrolled in RIP option. Dhanayoga did a quick analysis of what is the % of return that investors stand to lose when they go through the Regular Investment Plan (RIP) vs. Direct Investment Plan (DIP). ​The results are quite revealing and can help an investor to become wiser and switch to DIP mode from RIP mode. 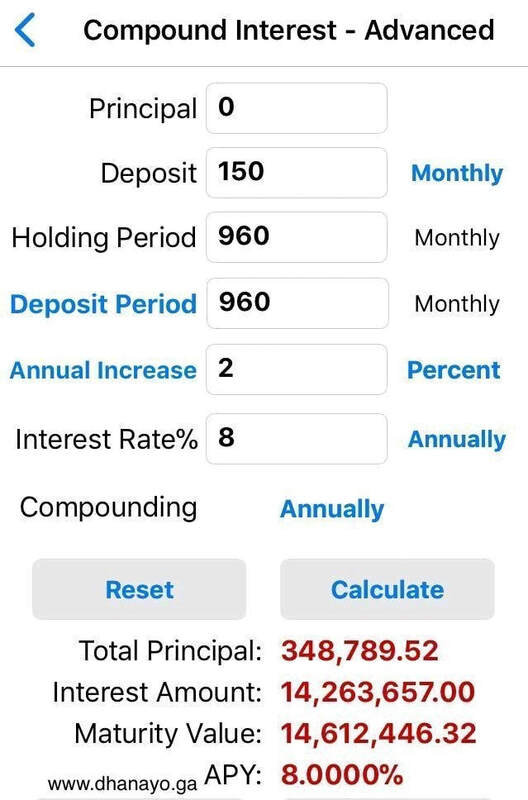 The figure below displays the incremental return that you can earn if you chose the DIP (Direct Investment Plan) instead of RIP (Regular Investment Plan) mode, for every 1L invested. If you invested 1 Lakh in a mutual fund that gives an average annual return of 20% p.a and for a period of 15 year period, the additional return that you can earn (if invested in DIP instead of RIP) is INR 2,04,238, which is evidently quite substantial. If you are a new or existing investor planning invest in mutual funds, prefer the Direct Investment option. Wishing you a very Happy and Prosperous New Year 2017!! This will help SEBI to get a perspective of "Investor's voice" and take it into consideration while formulating such regulations. This is a great opportunity to influence an important regulation that can go a long way in representing the real investor's interest. You can get the e-mail id to respond in Page 30 of the above pdf document and share your inputs on specific sections / clause which you wish to comment upon. When it comes to investing, the first question that comes to mind is - "Invest in what?" Every investor has his or her own appetite for risk and any rash and untimely decision can prove to be costly. This is because you need to choose from several asset classes having varying degrees of volatility and risk-return potential. 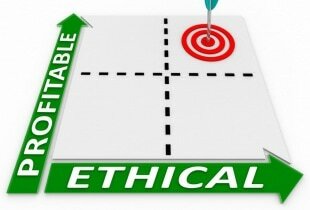 Therefore, one has to weigh the pros and cons before zeroing in on an asset class to invest in. 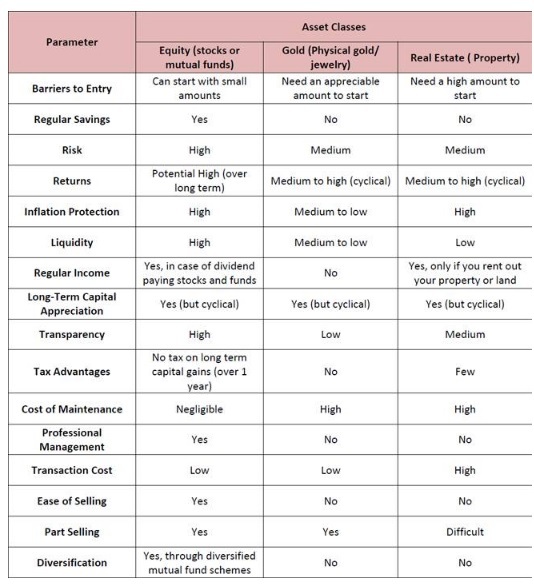 The comparison table given below compares Equity, Gold and Real Estate asset classes on various parameters. Welcome to share your experience..